What an amazing week in the studio! 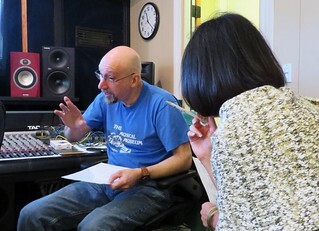 First, we recorded the finishing touches on my next CD project. Joining me on our songs were vocalists Maura O’Connell, Brittany Allyn, Joanie Keller Johnson, Odessa Settles, and Bruce MacKay. Then, the legendary Curtis McPeake dropped by and added his banjo to a song. We are now ready to begin the mixing process! Then, I ended the week by producing a wonderful contemporary gospel session for father and son, Brian and Darius Moore. These are exciting times here at Swift River Music!